Growing: Â Good for Beginners The popular Jack Herer stain is now available in feminized pot seeds at Homegrown Fantaseeds. The original Jack Herer is turned into a hybrid cannabis variety that can grow into females. Now, it is fast to produce buds and is easier to cultivate either indoors or outdoors. Thus, making it a perfect ganja for newbies in pot gardening. With just the basics in marijuana growing, a high yield can be obtained from Jack Herer during harvest. The flowering time of Jack Herer is from 9 to 10 weeks. 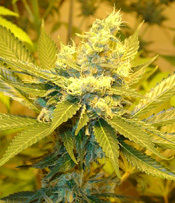 Growing Jack Herer indoors need an adequate space as the plants can grow with a medium height. If given abundant sunlight outside, they can grow taller and produce healthier and potent buds that create a powerful trippy high and delightful taste once smoked. The THC level that this strain has is high. It is high enough to uplift oneâ€™s mood and create a positive feeling. I can say that Iâ€™m already an expert in growing marijuana and in pot smoking but still there is something about this strain that keeps me coming back for more.